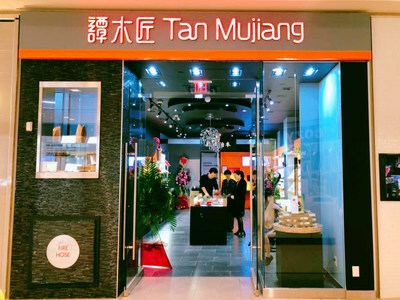 JURONG, China, March 22, 2019 /PRNewswire/ -- On March 8th, Tan Mujiang's first flagship store (H002) in Canada opened at the Scarborough shopping center in Toronto. The shopping mall is home to 230 shops and Tan Mujiang is situated in the busiest area of the mall, adjacent to Pandora and other international brand stores. On the opening day, Tan Mujiang attracted many customers into the store with its eye-catching Chinese logo and a lute performance. Many Chinese were surprised to see traditional Chinese wooden combs abroad, and many locals were impressed by the oriental charm and exquisite craftsmanship of the combs. They found that besides just combing their hair, the exquisite combs could also be a great gift for family and friends. Tan Mujiang is the sole listed company in the wooden comb industry worldwide. They have created more than 40 accurate processes to improve their products, which are made from the natural materials of traditional Chinese handicrafts and feature beautiful shapes, smooth lines, exquisite texture, rich colors and fine hand feel, perfectly integrating traditional culture and modern fashion. Since December 2013, Tan Mujiang has acquired more than 80 patents and provides supplies to more than 1,200 shops all over mainland China, 4 in Hong Kong, 1 in Singapore, and some online shops on Amazon and eBay. H002 is Tan Mujiang's second overseas store opened in 2019 after the store at HONGKONG Telford Plaza. They plan to open 12 overseas stores this year. Zhang Chuanjin, the offline market director said, "Our goal is to popularize our brand by operating our own franchise shops all over the world and not only get orders from overseas businessmen." Tan Mujiang has set up a national general franchising model and hopes to find some franchisees who are interested in their brand. The franchising model includes significant self-developing space and comprehensive support, including market research, location selection, opening preparation guidance, personnel training, store decoration, marketing demonstration and post-sales service, to ensure that the store can operate smoothly and successfully. Tan Mujiang will increase their investment in overseas market promotion. In addition to participating in grand international exhibitions, they will release their brand and product information on popular overseas social media platforms and hold a series of promotion activities for overseas stores.